"May your blessings outnumber the shamrocks that grow, and may trouble avoid you wherever you go." St. Patrick's Day is always a special day in the Bores House. It's the day Mr. B and I met, for the second time, and began dating (unofficially). Seven years later, we now make Monty celebrate with us. There were about 15 outtakes and 7 treats involved in capturing this photo of him. He really didn't want to wear the hat, so instead I put it on. 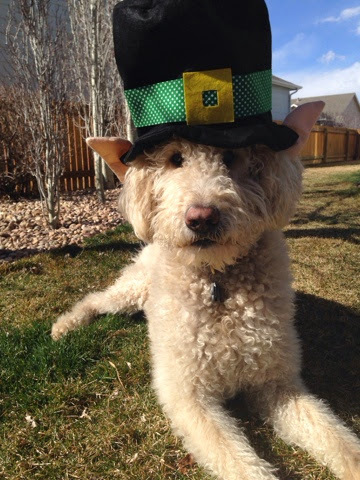 Not only did I wander around the house, but I decided to walk the dog around the block looking like one large leprechaun. I was convinced Monty needed to look festive, so I put two green leis around his neck. That didn't last either, because he seemed to maneuver those off by the time we made it to the end of our street. I am waiting for Mr. B to get home to we can celebrate with a Guinness. Monty doesn't like beer, so he won't enjoy that with us either. Perhaps we should go back to celebrating without him?